Albino cories are well suited for a smaller aquarium because when full grown, adult males only reach 2.5 inches (7 cm) in length and the larger females just a little bit more. A minimum 10 gallon tank is suggested. Despite being quite active, these are very peaceful fish that enjoy the company of their own kind as well as other fish. To be happy they need to be in groups of at least 5 or more fish, and a school of these very active little fish will make the bottom of your tank come to life. A mid-sized Albino Cory swimming peacefully. A nice and decent length video showing off a happy and healthy Albino Cory swimming around its tank and looking for food. The video shows off the peaceful nature of the Albino Cory and offers quite a few close up shots of each side of the fish. Social Grouping: Groups - Peppered Cories are normally seen in schools of 20 or more fish. The Albino Cory is a pinkish white color with bright red eyes. Its body is armored rather than scaled, giving it the common name 'Armored Catfish'. It has two rows of overlapping bony plates that run down each side and there are large plates covering the head. Its very name Corydoras is derived from the Greek words "kory" which means "helmet," and "doras" which means "skin." They have a lifespan of 5 years or more, up to about 8 years with proper care. Size of fish - inches: 2.8 inches (6.99 cm) - Females are larger than males. Lifespan: 5 years - They can live for 5 years or more, up to 8 years with optimal conditions. Lighting Needs: Moderate - normal lighting - They like higher light levels than most other corydoras species. Breeding Temperature: - 71.6° - 78.8° (22° - 26 ° C.) is needed for spawning. Same species - conspecifics: Yes - Keep in groups of at least 3, with 6 or more being desirable. Shrimps, Crabs, Snails: Safe - not aggressive - The natural diet of Corydoras paleatus is worms, crustaceans, and insects. The Corydorus have a very interesting breeding routine. The female will clean a spot on the aquarium glass, or perhaps an object in the aquarium to lay her eggs on. The males initiate courting, which entails chasing the females around the aquarium. The female will swim away, and the males search for her until she is found. The males seem to "shiver" on the female, and may in fact, lie on top of her. When she is ready to spawn, she turns to the male next to her, and adamantly pounds his ventral fin, causing the male to release sperm. A female can lay anywhere between 250 and 400 eggs. The eggs should hatch in 4-6 days after spawning. Do note that these fish will eat their own fry, so they will need to be separated from the parents. The fry should initially be fed protozoan organisms in the aquarium. As they grow, they will be able to accept foods such as baby brine shrimp. See the description of how to breed these fish in Breeding Freshwater Fish: Catfish. 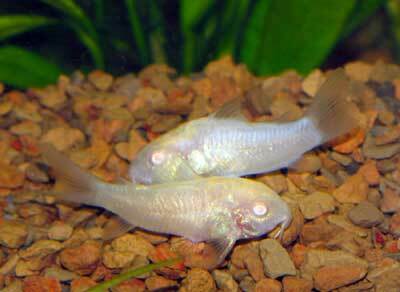 Albino Cories are very hardy and disease is not usually a problem in a well maintained aquarium. There is no guarantee that you won't have to deal with health problems or disease, but cory catfish are very resilient. Outdated inaccurate information.... The albino cory is of the species Corydoras aeneus ... Also known as the bronze cory... Selectivly bred in captivity for the albino trait as it does not occur in the wild. They do not even have the same body shape as the peppered cory. Not sure why that was even posted considering any other site anywhere online has them labled correctly. Really strange that whoever made this fish profile would post something so easily proven incorrect. I am getting an Albino Cory, and I really want to work hard to mimic its environment. What other plants and animals would it live with in the wild? I want it to feel at home. Cory's live in the fllod land and tributaries of the Amazon. There are a vast array of fish that they would be comfortable with. If you do groups of Cories thet will normally pair up and a good chance of mating if you create the right environment which is what you sound like you are going for. Make sure there is ample food sources for these very active bottom feeders! Create some hiding places, I call my albino Wally because often I have to look for him, in my tank I have 4 plants and two small rock caves, Wally can hide for a long while but is also content to just lay still on the bottom, however, when he gets active he hoovers the gravel, darts to the top for a quick breath and dives back down, seems to enjoy swimming against the blow current from my filter and enjoys scraping the glass - very entertaining little guy.